As many of us begin dusting off our bikes for a burst of spring fitness, we don’t usually give much thought to cycling’s early days, or how cycles came to be made. Many of the early models were very much a local product but still hard to come by. 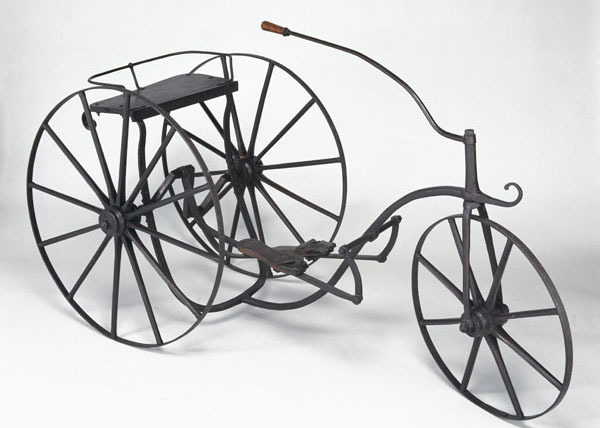 In 1837, the young John Charles Manning was desperate to own the very latest form of transport, a tricycle, or velocipede, as they were then known. A velocipede would have cost an unthinkable sum for Leamington family. However, John was a determined boy, and on a visit to Snitterfield, he managed to cadge the old iron fly-wheel of a disused malt-mill, and promptly took it home. He persuaded Mr Fisher, a smith with a workshop in Brunswick Street, to make two more iron wheels – a large one to match the malt-mill wheel, and a small guider. He doesn’t say how he came by the main shaft of the machine – a bed-post. Mr Fisher supplied cranks and treadles, and so the machine was eventually put together. It was then painted, – bright yellow, fine-lined in black. It must have been a wonderful sight, but once on the road, it revealed two major flaws. According to John, “It would only travel on the stone pavement, which the police prevented; and it made such a horrible clatter that it frightened the horses in the street, and the police put a stop to that too”. Not quite what the young inventor had anticipated, but he remained proud of the result. 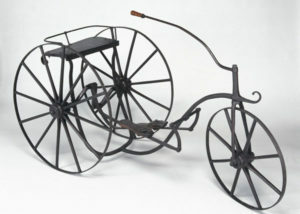 Even late in life he was still claiming stoutly to one and all that it was the first tricycle ever manufactured at Leamington, if not in Warwickshire, and that all concerned in the creation of “a machine so fearfully and wonderfully made”, should share his triumph.